1. Short title and commencement.- (1)These rules may be called the Fundamental (Second Amendment) Rules, 2018. Provided that the age of superannuation in respect of the doctors belonging to the General Duty Medical Officers sub-cadre of Central Armed Police Forces and Assam Rifles and Specialist Medical officers of Central Armed Police Forces and Assam Rifles shall be sixty-five years. (ii) The serving doctors belonging to the services referred to in sub-clause (i) who have either already attained the age of sixty-two years or attaining the age of sixty-two years within six months from the date of publication of these amendment rules in the Official Gazette, may exercise their option in regard to their posting to Teaching, Clinical, Patient Care, Implementation of Health programmes, Public Health programmes and functions including advisory and consultancy as specified in sub-clause (i), within a period of thirty days from the date of the commencement of the Fundamental (Second Amendment) Rules, 2018. 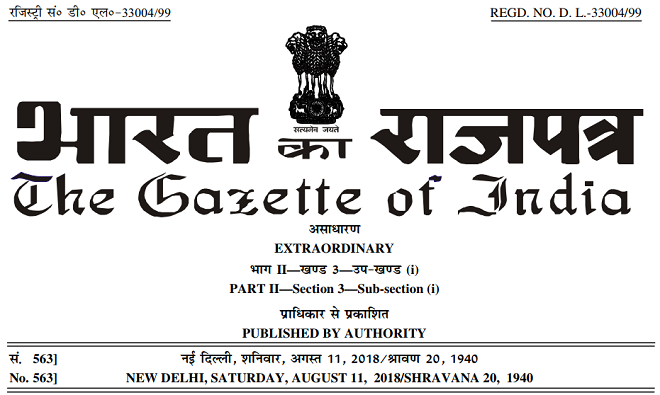 Note : The Fundamental Rules were published in the Gazette of India on the 1st day of January, 1922 and were last amended vide notification number G.S.R. 27(E), dated the 5th January, 2018.